Forces you to think while you read. Encourages you to make information your own (learn more). Helps you learn to identify and understand main points. Creates a reference that can be reviewed at a later time. Forces you to be organized. There are probably as many ways to take notes as there are people taking notes. But the key is to develop a note-taking system that you can improve upon as you grow older. If you highlight or record everything, you really are left with purposeless notes. The idea is to condense the information by focusing on the main points. What is it that is important? How can you summarize the information in your own words? Depending on the type of source you are reading, the text itself may help you find the important points. Look for bullets, highlighted passages, charts, figures, or other information that stands out. You can always recompile them later into some type of searchable, archived, and/or digital collection such as OneNote or EverNote. But writing them by hand will help you process and retain the information. So, if you are writing your notes by hand, you have to be able to read them when you are through! This is especially important when taking notes for a research project. You will not remember where the notes came from if you are using more than one source. Some notes will also need to be direct quotations. Be sure to attribute those. Tools like Zotero or EndNote are very helpful here. To help with organizing your notes, you can add chapter titles, subheadings, or create headings of your own. This will help you find information more quickly. It will also help you organize your notes. This one isn’t perhaps as intuitive as others, but oh-so-helpful when searching for something specific. If nothing else, you’ll have a chronological log. You will appreciate reading this later. It also helps you determine the usability of the material. Include questions that you have that remain unanswered — lines of further research. Taking notes on a lecture. If you focus too much on the note-taking you will have a better chance of missing key points. Don’t try to write down complete sentences. Hit the keywords. Think outline here. Listen for signals to key information: transition words (first, finally, etc. ), repetition, vocal emphasis, and other clues. Add headings in the margin on the fly. This will make it easier to find the information you are looking for later. Rewrite your notes in an organized manner. 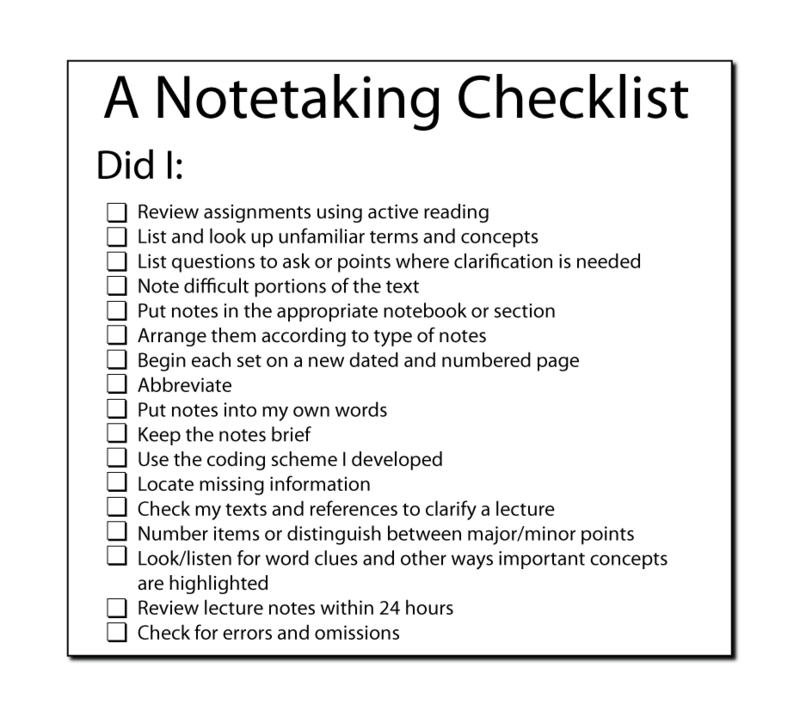 If you are new to note-taking, you may appreciate one or more of the methods outlined in the resources below as a way to get started. Five different methods of note-taking described along with their strengths and weaknesses from the Academic Skills Center at California Polytechnic State University. Strategies from Mortimer Adler that launch you into becoming a better note-taker. Nice summary from Carlton College for taking notes from a lecture. One way to take notes. Interactive at ReadWriteThink.org that teaches students to pull out the main facts when taking notes. Another interactive at ReadWriteThink that helps students summarize by outlining. Most homeschool families will be familiar with this definitive book on how to interact with what you read. Subtitled The Classic Guide to Intelligent Reading, describes different ways to read different books based on genre. Also includes several note-taking strategies. This Core Knowledge lesson plan takes an entire year to complete, so be forewarned. But when the student is done, he has created his own “Book of Knowledge” and developed outlining, note-taking, and researching skills in the process. Great idea for those with the time! Some might find this checklist helpful as they get started. Form that is helpful for practicing summarizing skills.